A daily newspaper has illustrated the extent of the homelessness crisis with an “arresting” front page comparison. Official figures have shown that one household in Scotland was made homeless every 18 minutes last year. 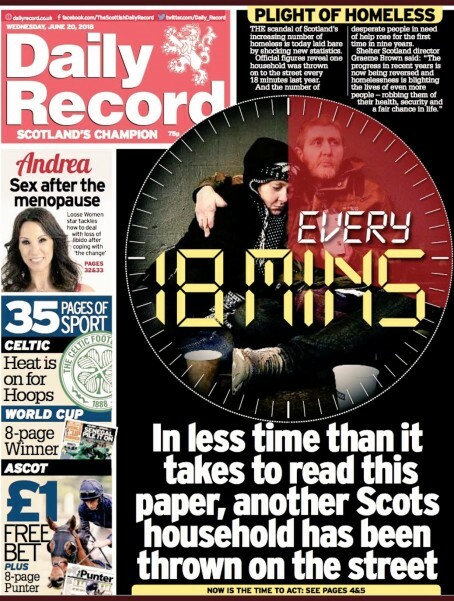 In order to highlight the issue, the Daily Record splashed yesterday with the headline ‘In less time than it takes you to read this paper, another Scots household has been thrown on the street’. A total of 28,792 families in Scotland were confirmed as homeless during the year according to the report, produced by the Scottish government, on which the Glasgow-based Record’s story was based. Associate editor Kenny Rattray told HTFP: “When we heard the grim statistic that a Scots household is made homeless every 18 minutes we knew it should be the front page story. “I wanted to think of something that takes 18 minutes which readers would relate to rather than just a bald fact. So it seemed like reading the paper was the perfect example, as they were reading it at the time. From that point I just worked up a countdown clock-style graphic and refined the image with the design editor. “The aim was to create an arresting image to draw people’s attention to the subject matter. Many residents of big cities walk past the homeless every day and don’t notice them as tragically they are so commonplace. I’m not sure taking less than 18 minutes to read a newspaper is anything to crow about let alone use the unflattering fact as a comparison to homelessness – but I can see what they were trying to do in a roundabout way.